How to Define an Idea. All I know is What I have Concepts for. In this article, we will use the structuralism of Ferdinand de Saussure¹, as a medium for exploring the notion of the idea as a concept. If you’d like to start from the beginning of this series, please read the introduction. Saussure, a linguistic theorist, was interested in language, (and anything we can call a semantic system), as a structure which makes meaning possible. We use language to define and give meaning to our ideas and perceptions, even within our imagination. When our minds make sense of what we conceive or perceive, it’s parameters of definition are bound by our concepts. If the brain has no idea that maps adequately to experience, the knowledge or perception will be incoherent or inconsistent. Saussure believed that if we had no language, our thoughts could only be a shapeless and distinct mass and that language gives us the very structure by which we think. Whether a concept or a word comes first is a scientific and philosophical debate that’s outside of the scope of this article. Neuroscientist Lisa Feldman Barrett, notes that people can form certain concepts before knowing the word³. However, no concept can be established or known without language. The language of thought hypothesis⁴(LOTH) describes the nature of thought as possessing “language-like” or compositional structure, sometimes referred to as mentalese. Thoughts consist of simple conceptual tokens combined in a systematic syntax akin to the way words work in language according to rules of grammar. So Wittgenstein is still right in a sense, and we could rewrite his 2nd sentence to read “all I know is what I have words or tokens for.” Babies for example would form concepts using mentalese⁵, and non-human animals presumably may have more straightforward but similar dialects. People seem to be able to formulate novel concepts which are left to be named later; the concept comes first, the name second⁶ . Lewis Carroll was able to get away with all of these “portmanteaus” and “factitious” words because, while Alice didn’t know the words, she was able to grasp their underlying concepts. The author created the words to name mixed feelings and creatures that he created in his mind. According to Ayn Rand⁷ definitions state the meaning of concepts, not words. A word is merely a visual-auditory symbol (sound image) used to represent a concept, having no meaning other than that of the concept it symbolizes. 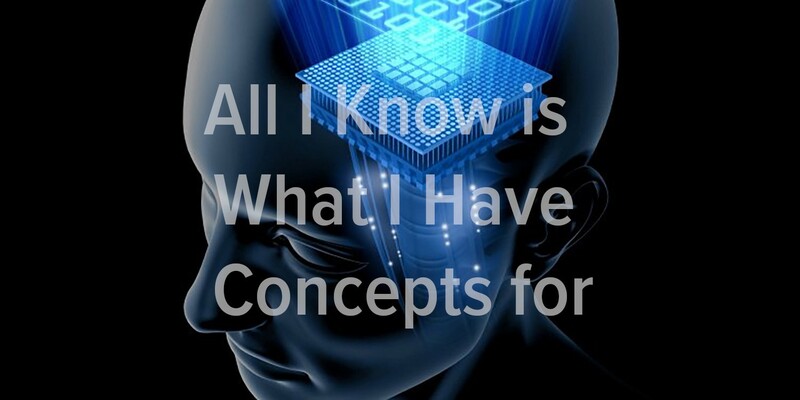 While Saussure was preoccupied with the representation of concepts with words as a sound image, the notion that there is no knowledge without concepts also applies to other forms of perception including sound, vision, and even emotions. Sensory experiences would be incoherent or inconsistent without concepts. There is evidence that, until modern times, humans didn’t see the color “blue” as blue because they didn’t have a concept for it⁸. In the language of the Himba tribe from Namibia, there is no word for blue and no real distinction between green and blue. In tests conducted by Davidoff⁹, he showed members of the tribe a circle with 11 green squares and one blue square. The Himba tribe struggled to see any difference in the 12 squares. According to Professor Lisa Feldman Barrett, “Red” is not a color contained in an object. It is an experience involving reflected light, a human eye, and a human brain. For the brain to convert a visual sensation into the experience of red, it must possess the concept “Red.” Without this concept, the human mind would experience the apple differently.” For instance, to the westerner, apples reflecting light at 600 nanometers is experienced as red, but the Berinmo people of Papua New Guinea experience it as brownish because their concepts for color divide up the continuous spectrum differently¹¹. In Western culture, an octave divided into twelve equally spaced pitches¹³ is the basis for most music, while with Indonesian gamelan music has seven pitches per octave with varied tunings. To Westerners listening for the first time, gamelan music is more likely to sound like noise. The western brain accustomed to listening to twelve-tone scales doesn’t have a concept for gamelan music¹⁴. Professor Barrett tells us that we need emotion concepts to experience or perceive the associated emotion; “We cannot experience sadness with all of its cultural meaning unless you have the concept “Sadness.” Feldman Barrett goes on to emphasize that any healthy human can experience low-arousal, unpleasant affect, but cannot experience sadness with all of its cultural meaning without the concept “Sadness.” Without the concept “Sadness” to categorize with, there is no emotion, only a pattern of sensory signals¹⁵. We can form concepts without words but we need language, or instead, we need a linguistic system. Albert Einstein, presented complex ideas, not with words but with the precise syntax of mathematics. If you’ve ever had a thought on the tip of your tongue, or an idea or feeling that words could not express, perhaps these concepts were stuck in the language of mentalese. The next part of the series will continue our exploration of structuralism, specifically Saussure’s concept of the linguistic sign and what he referred to as its “arbitrariness.” We will delve into the proposition that ideas are social constructs and not objective universals. Cecil (CJ) John is an architect, technologist and innovator and has worked with some of the largest companies in the world including the IMF, US Federal Government and some of the top 5 consulting companies. If you like what you have read, you can follow me on Medium for more great content. You can also sign up for my newsletter or contact me by email, Linkedin or Twitter. Jules Davidoff, a psychologist from Goldsmiths University of London. The equal-tempered scale codified by Johann Sebastian Bach in the seventeenth century. I am an architect, technologist & innovator. For hobbies: I write psychology & philosophy, compose jazz, perform standup comedy and am a black belt in kung fu.